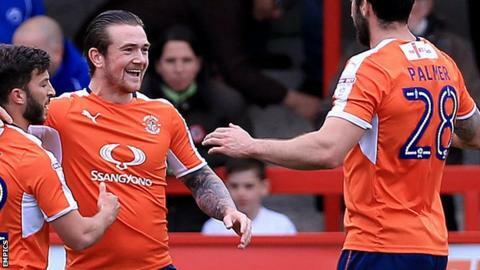 League One side Peterborough United have signed Luton Town striker Jack Marriott on a four-year contract. The 22-year-old scored 12 goals in 47 appearances for the Hatters last season, helping them reach the League Two play-offs. He has moved to the ABAX for a "substantial fee", according to Posh chairman Darragh MacAnthony. MacAnthony also said Posh had turned down offers from Bristol Rovers for strikers Luke James and Tom Nichols. James, 22, spent last season on loan at Rovers, playing 30 times, while 23-year-old Nichols scored 13 goals in 51 appearances for Posh last season. MacAnthony added that the club are negotiating with a Scottish Premier League club over the sale of 22-year-old striker Shaq Coulthirst. On the signing of Marriott, Peterborough boss Grant McCann told the club website: "He is like a young Craig Mackail-Smith in terms of his energy and his pace to run in behind and it is perhaps something that we have missed. "I believe it is a good coup for us because there were a couple of Championship clubs in for him."